Well my birthday is just a month away. I thought I will do a big fat giveaway. 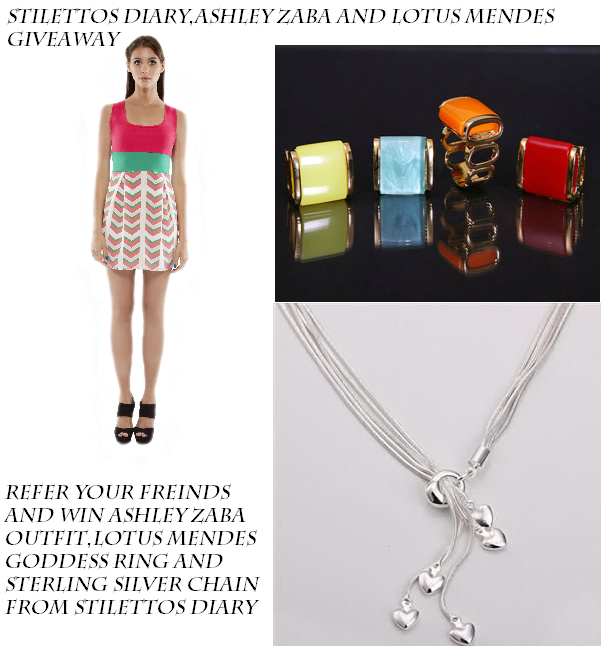 Chance to win Ashley Zaba outfit, Lotus Mendes Goddess Rings and Sterling Silver chain from Stilettos Diary. HOW TO WIN ALL THESE?? VERY SIMPLE. 1. JUST FINISH ALL TASKS ON THE RAFFLECOPTER. 2. REFER YOUR FRIENDS TO THIS GIVEAWAY (YOU CAN SHARE ON ALL SOCIAL WEBSITES, TWEET, FB, PIN IT, STUMBLE UPON,BLOG, MESSAGE, EMAIL.. CHOICE IS YOURS... ). REFER 10 OF YOUR FRIENDS TO THIS GIVEAWAY AND ASK THEM TO PARTICIPATE. WHY THE RAFFLECOPTER TASKS?? (WELL FROM RAFFLECOPTER I WILL RANDOMLY PICK 2 WINNERS. EACH WILL GET A LOTUS MENDES GODDESS RING). P.S. PLEASE ENSURE THE TASK ON RAFFLECOPTER IS DONE. (SUPPORTING THE SPONSORS IS MUST). NOW GET TO IT... SPREAD THE WORD..TWEET , FB , PIN IT, BLOG, MESSAGE, EMAIL ALL YOUR FRIENDS AND ASK THEM TO PARTICIPATE AND WIN!!!!!! Hey akhila :) you can pair gladiators with - denim skirt/ asymmetric skirt, a dress - especially a shirt dress( trending right now) or you can go for a simple dress and add a twist with gladitors and matching bag. Or you can keep your gladiators and lipstick matching. I have done 3-4 posts wearing gladiators. check it out..
Thanx a lot Megha for the reply. Will try out your suggestions. Hi..what a grand grand giveaway i must say :) love all the 3 things <3..i have completed all the above tasks and now wud refer my friends via Facebook. I saw this on my GFC feed. I was referred by your blog post on Bloglovin! I got an email from Megha M.
Thanks for having this awesome giveaway and letting me know about it. Great!!!!! I was referred by you, because I was already a GFC follower!! hi! :) I was referred by you! :) I already follow you on bloglovin! I I was referred by your blog post on Bloglovin! Thanks!!! & Happy Early B-Day!! No one referred me to this giveaway. I follow you through GFC & that's how I found out. Happy Birthday in advance!! happy birthday in advance ..
Amazing giveaway again! No one refereed this to me ( I already followed via bloglovin so I found this that way) , but I surely will! This giveaway was referred by Greta Miliani on fb!! Heya :) Thanks a ton for this giveaway :) No one referred me. I'm gonna refer this giveaway to as many peeps as i could. I was referred to you by Nupur. I wish you all the best for your birthday in advance. I was referred by you!!! i was referred by rhitima,but i do not have a twitter account. i kinda love the dress man!well,rhitima referred this one to me,n i am so impressed!!! ummm,rhitima told me about this,but i could fulfill only a few tasks,will my entry be accepted? hello,i got to know about this from rhitima,nice giveaway indeed!! i was referred by your lovely self :) happy birthday! and congratulations! My birthday is May 9th too!! hi,rhitima referred this to me. rhitima basu referred this give away to me. All done! Fantastic giveaway, I love, love, love the Lotus Mendes rings. I was referred by you! Fantastic giveaway! I love, love, love the Lotus Mendes rings. I was referred by you so thanks!! this is soooo cool ! Rhitima Bas referred me to it..
Rhitima basu referred this giva away to me. Rhitima Basu referred this giveaway to me! I was referred by Rhitima Basu! Gustosa Giveaways referred me, thanks! just saw your blog link at my blog, viewed yours and saw this awesome giveaway... hoping I win!